Based on an old surrealist game, Kinderlit’s Exquisite Corpse pairs up three illustrators to collaborate on the creation of a character; the catch is that none of three know who the other two are, nor what their contributions look like. To add a little twist, after we assemble the pieces we send the creation to a children’s book author to write a little something inspired by our Exquisite Corpse. As Harvey Shmeck, botanist and part-time inventor, stood in the middle of his greenhouse he wrapped his gnarled hands together in glee. His baldhead twitched, his birthmark—on his cheek and the shape of a mushroom—turned just a tiny bit redder, and his eyes danced underneath his thick black-rimmed glasses. He gazed upon his robot and smiled. The robot—number 266-X—was perfect! Well, not perfect. It was quite flawed, if Harvey was honest with himself. It didn’t look nearly as impressive as robot number 265-X with its large water pistols and glowing cobalt-eyes—but still, the robot was complete. “Ah-choo!” Harvey sneezed. It was not easy being a botanist who was allergic to plants, and especially the hanging vines that filled the greenhouse. Harvey was not allergic to robots, though. Maybe that’s why he loved building them. Harvey sniffled and continued gazing at his creation. Choosing the design of the robot’s head had been the most difficult part. Harvey had, at first, given the robot the head of a rabbit. There was no reason for that really. Harvey just liked rabbits. But that robot look sort of monstrous with a giant hare head, so Harvey settled on a head that looked almost exactly like that of his fourth grade teacher. Harvey didn’t want his robot to be scary, and of all Harvey’s teachers Mrs. Walters (his fourth grade teacher) had been the least frightening. The body of Robot 266-X was more artistic than humanoid. Harvey chuckled at the design—inspired by his front hall closet and a cluster of coat hangers that had been tangled. He had hung an air freshener (it looked sort of like a small sun) in the middle. Pine-scented. Harvey wanted a pleasant-smelling robot. Had the greenhouse vines stirred up Harvey’s latest sneeze, or had it been the pine-scented dangling sun? “I should have purchased the ‘vanilla-bean’ air freshener,” Harvey thought to himself. But now wasn’t the time to worry about scents. Now was the time for the robot to come alive. Harvey imagined fame! Fortune! And most of all, something to help water the plants in the greenhouse. As Harvey wiped his nose the robot creaked. Its legs moved. Its arms wiggled. The dangling sun swung back and forth. “I’ve done it!” yelled Harvey. The robot spun, took three steps, and then walked right into one of the hanging vines and tripped. The body crashed to the ground violently, shaking the floor and the greenhouse windows. The robot’s circuits fizzled, sparked, and then robot 266-X’s head exploded. Shards of metal landed in a heap around Harvey’s feet. “Not again!” whined Harvey, thinking of how his last thirty-eight robots had all tripped over vines and exploded. Maybe he should try building his robots somewhere other than the greenhouse. “Ah-choo!” Harvey sneezed. “Yes, I will build Robot 267-X in the garage,” thought Harvey. Elly MacKay makes some of the most beautiful illustrations imaginable, using paper, ink, paint and light. She wrote and illustrated If You Hold A Seed (2013),Shadow Chasers (2014) and Butterfly Park (2015, read our REVIEW), all published by Running Press. She’s scary-good, and –luckily– her work can be purchased on Etsy. Nathan Jurevicius is an Australian-born, Toronto-based graphic designer and world renowned artist, whose latest is the graphic novel for kids, Junction (Koyama Press, 2015). He is best-known for Scary Girl, a multi-platform modern folktale, which encompasses a graphic novel, vinyl toys and even an X-Box game. Debbie Ridpath Ohi is the Toronto-based illustrator of books by Judy Blume and Michael Ian Black, as well as her solo picture book debut, Where Are My Books? (Simon & Schuster, 2015). Allan Woodrow is the Chicago, Illinois-based author of The Rotten Adventures of Zachary Ruthless (HarperCollins, 2011) and the forth-coming Class Dismissed (Scholastic, 2015). He also writes under the pseudonym Fowler DeWitt. 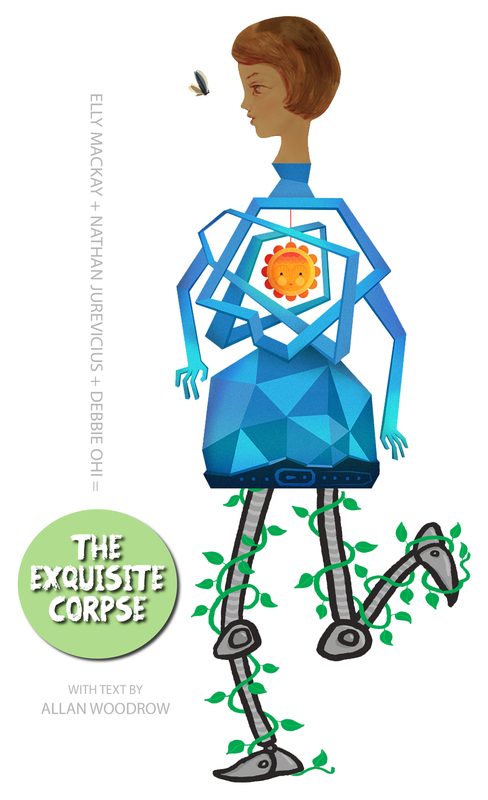 The Exquisite Corpse was assembled by actor / director David Tompa. You should follow him on Twitter.